Mr. Crumbs and I joke that he’s come a long way since his Pepsi, Dorito and Hot Pocket days in college. It was a major turning point when he traded store-bought Hot Pockets for homemade hot pockets instead! And while he still enjoys the occasional salt and vinegar potato chip, he really truly gave up soda years ago. Reading about the harmful effects of high fructose corn syrup is what finally nailed that coffin shut for good. He does miss the fizz though, so I make it a point to make second ferments of kombucha to help him with that. 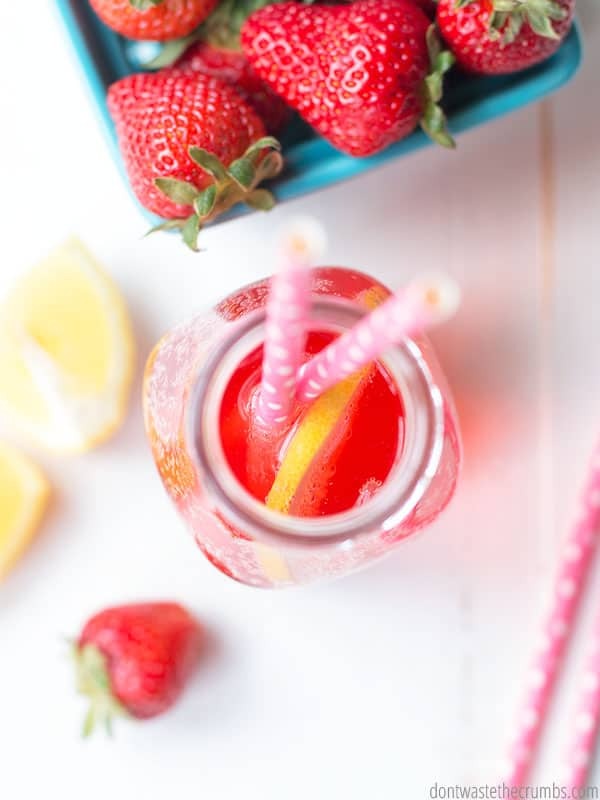 Right now with summer knocking on the door, strawberry lemonade kombucha is the flavor of the month! Now here’s the thing. I think it’s really funny hearing him say he misses the fizz because I’m not a fizz girl. I like the flavor of kombucha from the first ferment alone when I add herbs, and right now I’m totally into rose hip and hibiscus kombucha. Plus my continuous brewing system allows me to have kombucha, literally on tap, whenever I want. My husband though is a HUGE fizz fan and I know he’s not alone. One member from my Grocery Budget Bootcamp course recently told me that they’re taking all the money they’re saving by NOT buying soda, and investing it into whatever they need in order to make kombucha instead. Her family loves the fizz, but they know that soda is not only expensive, but it contains lots of unhealthy stuff too. If you fall somewhere in the middle between no fizz and lots of fizz, know that you can get some fizz and carbonation in the first ferment alone. Lots of variables come into play, but I’ve noticed that the type of tea you use is important. I definitely get more carbonation when I use this blend of green and black tea, versus using oolong tea. But in order to get the fizz my husband misses (and really enjoys), I need a second ferment. If you’ve never made kombucha before, this post might seem like Greek. I assure you that brewing kombucha and making a second ferment is not as hard as it sounds, but it’s always best to start at the beginning so you understand what exactly is going on. 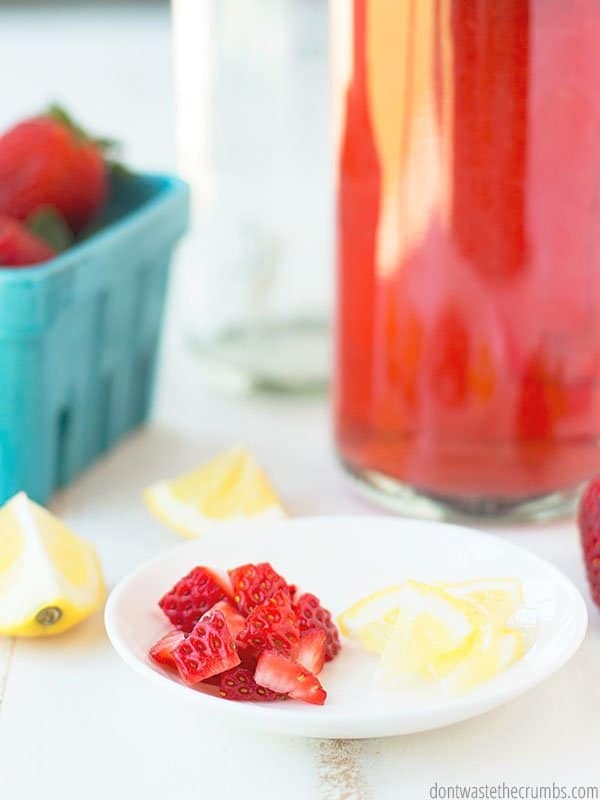 If you’re new to kombucha, go back to this DIY kombucha recipe post. There I show you how to build your own brewing system on the cheap, using supplies you might already have on hand. Then come back to this post, so you can learn the art of a second ferment and create some serious fizz! The amount of fizz and carbonation you create in kombucha boils down to three main factors: time, a 100% seal, and sugar. No matter how you want to flavor a second ferment – or if you even want it to be flavored at all – you need time if you want a good fizz. How much time is slightly debatable. Some kombucha batches will make a good fizz after 4 days. Some take 7-10 days. The amount of time needed to get a good fizz and carbonation in your kombucha is dependent on the type of tea you use (some teas take longer) and the temperature. Cooler temperatures slow the fermentation process, so a jar in the fridge will take longer to fizz than a jar sitting on the counter. This is referring to the jar you’re using. You need to use jars that make an air-tight seal otherwise you won’t get that over the top soda fizz we’re looking for. I have and LOVE swing-top bottles very similar to these, except mine are much larger (33.9 oz) and I found mine at ALDI. Although they were filled with lemonade, I bought them anyway. The kids drank the lemonade as a treat, and I promptly washed them and declared them mine for kombucha. You don’t have to use swing-top bottles though. If you have pint mason jars, or even quart mason jars – both will work well. Something to consider when you’re choosing a jar, is where you’ll store your kombucha. In the fridge door? On a fridge shelf? On the counter top? You want to make sure that where ever you store your kombucha – both as it ferments for the second time, and for longer-term storage – that your jar fits in the space. Most importantly though, you just want to make sure you’re using something with an air-tight seal, and something you can easily open and close as you drink the kombucha. I know you already use sugar to feed the bacteria of the SCOBY. When the taste of your tea has turned from traditional sweet tea to slightly tangy and possibly fizzy, the sugar is practically gone. But, in order to make seriously good fizz, you need more sugar. Now, I have two caveats. One, you don’t HAVE to add anything if you don’t want to. Some brewers can get a decent fizz just by bottling up their first brew and letting it sit for a second round. This hasn’t been my personal experience, but it’s apparently worked for some. Two, kombucha is a super healthy beverage, so we don’t just want to add sugar. And if you do just add sugar, you’re not adding flavor. So ideally, we want to add something that is naturally sweet AND will add flavor. Many brewers add fruit juice, but the quality of fruit juice is debatable. Many juices are watered down or made sweet with artificial sweeteners. You can buy 100% fruit juice, but according to this article, it’s super high in sugar. This is technically a good thing if we’re flavoring kombucha, because we’ll only use 2-4 Tablespoons per 16 oz batch of kombucha. But, 100% fruit juice is not cheap and it’s perishable. You have to either have to bottle lots of the same flavor of kombucha so you don’t waste the juice, or drink whatever is leftover before it expires… but then we go back to the fact that it’s really high in sugar. These are the main reasons why I choose whole fruit as the source of sugar instead of fruit juice. It’s so easy to use whole fruit, especially since I’m buying it weekly for snacks and recipes anyway (like no-cook strawberry freezer jam). It takes 1/4 cup for my big 33 oz jars, so you only need 2 Tablespoons of finely diced fruit to flavor the 16 oz jars I recommend. In day-to-day terms, it’s the same as 2-3 strawberries, a slice of pineapple, less than 1/4 of an apple… things you can simply set aside as you’re chopping fruit for the kids anyway. It’s barely a dent in your grocery budget (if any, really) and it’s so much more convenient than buying juice. And WAY cheaper than buying flavored kombucha at the store! Plus when you use whole fruit, you can flavor your kombucha anyway you want! 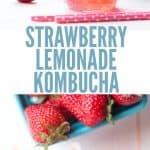 My husband LOVES pineapple with anything, but he’s enjoying strawberry lemonade kombucha right now because strawberries are in season and cheap! Plus with the heat outside, it’s such a refreshing flavor! Fill with the brewed kombucha and seal completely. Let sit on the counter at room temperature for at least 5 days. For more fizz, let it sit up to 10 days. Open carefully over the sink and taste. 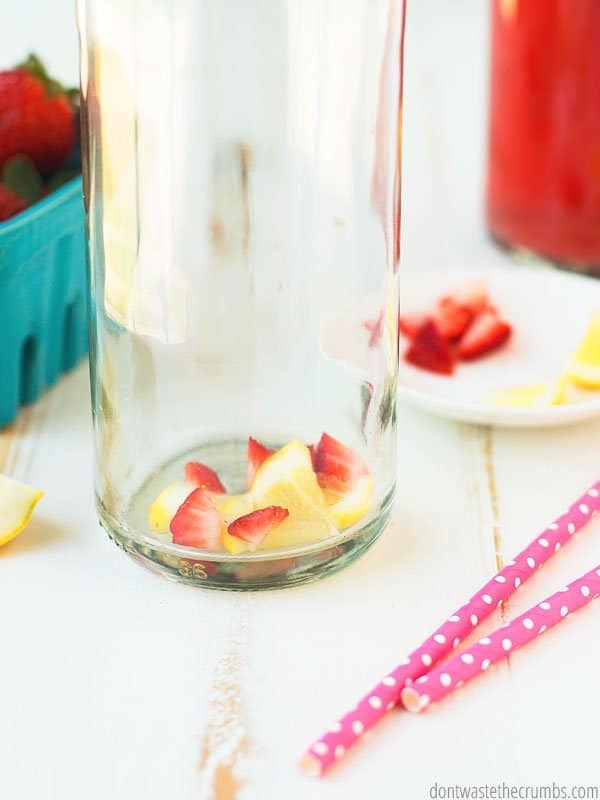 If the fizz is to you liking, seal the jar and store in the fridge to enjoy cold. You can store this at room temperature if you prefer, but know that the kombucha will continue to ferment at room temperature. How do you feel about the fizz – love it? Hate it? Have no preference? Leave your thoughts in the comments below! Can you make this without white sugar? I can’t have white sugar. I actually meant to post this question on the basic Kombucha recipe for a first timer …..but can you make the kombucha without sugar? Hi Destiny! Yes, you can brew kombucha without white sugar. I’ve seen where people have used honey (not raw) and they use a scant cup in lieu of one full cup. Most white sugar is beet sugar, so if that’s the issue, you can try cane sugar instead too. Also, less processed sugars (palm sugar, turbinado, etc.) work. Something to remember, if sugar is the concern, is that the amount of sugar present in finished kombucha is 2-6g. Compared to a glass of orange juice that has 24g, and carrot juice that has 13g. Love reading your blog posts. Great ideas…I did have a comment about kombucha second fermentation. I have been making my own kombucha for about a year and had a bottle explode on me during the second fermentation. I had flavored it with pineapple and it was really warm in my kitchen. I still do second ferments since I love it a bit bubbly but I make sure that I burp the bottles at least once a day or sometimes more if I notice a lot of bubbles on the surface of the kombucha. This has saved it from blowing up again and I still get a great fizz. I love the strawberry lemonade flavoring idea. I have done lemon before but not with the idea of it being lemonade. duh! My favorite flavoring is still raspberry lemon. I found some frozen organic raspberries in the clearance section at my grocery store and bought them all to save for smoothies and kombucha. Yes! Thank you for the tip on burping! We actually had a VERY similar experience with pineapple and peach (imagine a container of peach puree splattered all over kitchen window blinds, ceiling above the sink and surrounding kitchen cabinets!!). We burp when we see lots of bubbles too, and it’s primarily in the summer. Our temps haven’t gotten to warm just yet, so thank you for the reminder!! I’ll watch for raspberries – the idea of raspberries and lemons sounds SO refreshing!! Hi! I’m making my first batch of kombucha right now I just bottled up my first three 12 oz bottles for their 2nd ferment, one with juice added and two with pureed strawberries. I have to admit, having only had store bought kombucha before, it seemed a little silly when people said to burp the bottles every day during the 2nd ferment in order to release the carbonation. I mean, isn’t the carbonation what we are going for in the first place? I feel like there must be a reason why you can’t just let it ferment for less time without burping instead. Hi Cheryll! 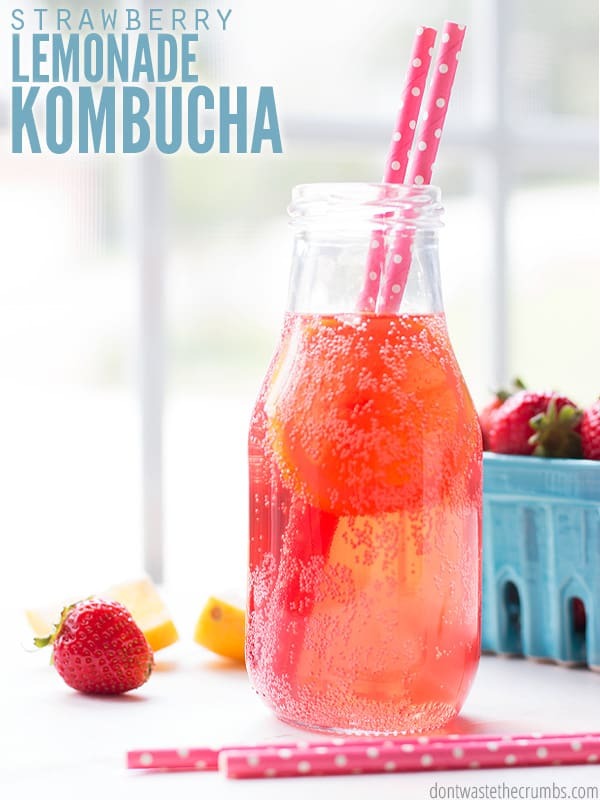 The reason for burping is because kombucha makes A LOT of carbonation up front – way more than you want or need! You need to burp it to let some of the air out, otherwise when you go to drink it in a few days, everything will shoot out and explode on you! (Ask me how I know, lol.) You won’t sacrifice any carbonation – trust me! So… I don’t need fizz, but I recently made blueberry kombucha “soda” and it totally worked – fizz and all! This sounds even better. Pinning. Thanks for sharing Steph! I love the blueberry flavor too! I LOVE the fizz! I’ve been making kombucha using 100% fruit juice for the secondary ferment. I find that the juice keeps long enough in the fridge for a number of batches. I’m curious if the whole fruits sink to the bottom with the rest of the dregs or does it need to be strained out? Your recipe sounds yummy! We’ve tried fresh apple juice, ginger, and chai spice tea with more sugar… Not sure I’ve found a favorite except for the fresh apple juice (blended apple strained). Hi Jenette! How do you flavor with the tea, just brew that tea, with a bit of sugar, and use that in the second ferment? I also need the fizz, but my sodas were much cheaper than my beloved La Croix are now. I have always been intrigued by kombucha. Is there any way to make it without tea? Thank you! Unfortunately kombucha IS fermented tea. You can make water kefir though, which is fermented much like milk kefir! I made kombucha for about a year a couple of years ago and then we moved and I haven’t started it up again. We need the fizz so I always flavoured it, but never with solid fruit because I thought it would likely be hard to clean the bottles. I went through quite a ritual of cleaning and sterilizing the jars and keeping my tools sterilized also. (I always used vinegar.) Do you concern yourself with all this? My daughter wanted kombucha and I told her not until Dad makes me a cupboard for it. (I have what I think is at least a 2 gallon keg with spigot.) Since he hasn’t done that, she went and got her own kombucha kit! It uses a large jar with temperature sensors on it (way cool) and my swing-away caps like yours. Those bottles never get properly cleaned by my standards because I’m staying out of her production system. Do you think there is anything to be concerned about? Hi Connie! I don’t sterilize the jars separately, but I run them through the dishwasher which I’m pretty sure works for this purpose. I don’t think it’s necessary to officially “sterilize” the tools and jars if the scoby isn’t touching them. It’s really no different than a drinking glass – do you sterilize those separately? And the knives you use to cut fruit for breakfast? That’s the way I look at it.